First I was ignorant, then I became annoyed. Now I am alarmed. Why do many Jews and some Christians put a dash in the place of the vowels in English words that refer to the God of the Bible? Why do they substitute generic terms such LORD in place of His knowable personal name? The earthly reason is history. Jews, before Jesus, believed pronouncing the name of God could become blasphemy, so it was banned. I respect their intent and believe they will come around to using His name in the fulness of time, which is soon! (This is actually predicted in the Talmud.) Later, institutionalized Christendom gladly picked up the man-made tradition, intentionally obscuring the Hebrew roots of the faith. The “under earth” motive is from satan’s wish to defeat Yehovah God and take His throne. He has opportunistically seized the moment today for further confusion through the rise of the false god of Islam. The name of that god is more well-known today than the name of Yehovah. I challenge you to notice the multitude of prophetic references to God “making His Name known” throughout the Bible. If He wants to make His name known, how come so few know His name? Thirdly, the Heavenly plan seems to be the judgment of God. He has allowed His name to be obscured until now in the appointed last generation. His name has four Hebrew letters expressed in English as YHVH. 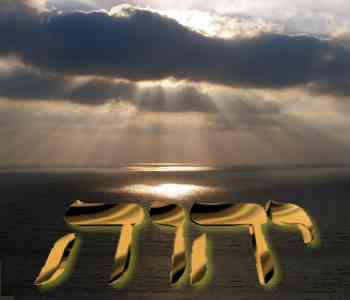 This personal name of God is used 6,828 times in the Hebrew text. Yet, Jews will not utter it and Christians miss-translate it. If we heard Paul say those names out loud in Hebrew, I believe it would be this: Yeshua ha Meshiach is Yehovah. Jesus, the Messiah, is Yehovah. Finally, back to G-D and L-ORD. It is time folks! It is time for all Bible believers to start using His personal name. I call for all to prayerfully consider this appeal. Islam is the direct opposing force. What a surprise when folks find out that “the great satan” turns out to be the god of Islam. Choose this day where you will stand. The great cosmic rebellion from eternity is about to end. We have read the end of the Book and we win! Satan is futilely pulling out all the stops to defeat Yehovah, but has already lost. It was over when Jesus died and rose from grave. His blood satisfied the price demanded by a just God. Jesus’ submission to His Father overcame the self-will model perpetrated by the devil. The Hebrew Scriptures don’t say “praise the LORD”, they say Praise Yehovah! (Praise Yah!) There are many lords and many gods, but only one true Yehovah. Choose you this day which one you will serve. As for me and my family, we choose to serve Yehovah and Yeshua ben Yehovah who we know as Yehovah the Father and Jesus the Son of Yehovah. You still did not explain on simple way why they use the dash! The dash is just a placeholder to remind that it not pronounced and even the generic term is to be respected. Thanks for your comment, Paul.